Higgins Rat Ranch Conservation Farm is located in Alberta, Canada. During the winter the temperature can drop as low as -45C. Specialist care is of course required. I’m pleased to welcome Tara Higgins as a guest post this week to share her tips for looking after bantam ducks in these extremely cold winter conditions. 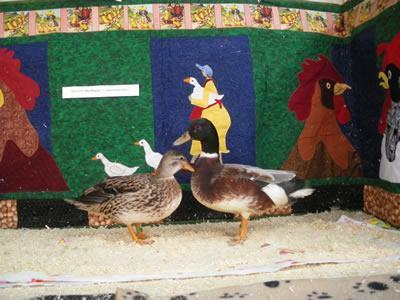 This article is about what works for us in keeping our bantam ducks comfy and happy. 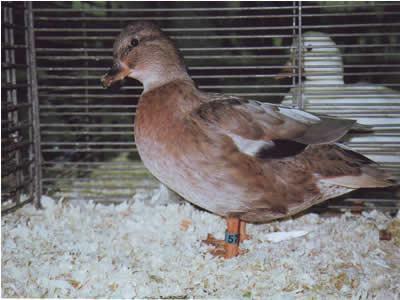 Let’s face it, we’ve been smitten by Call Ducks and Indies; bantam breeds as opposed to standard sized ducks. One may keep about five Calls / Indies to one Rouen or Khaki Campbell or Runner duck in regards to facility size, feed amount, etc. We are not particularly fond of duck eggs, so egg production for consumption is not relevant to our situation. Ducks who produce lots of eggs must eat more food to manufacture these eggs. Our bantam ducks produce quite a lot of eggs as it is! Bantam ducks are small, hardy, easy to feed, require less space to contain, fun to look at, less mess, good resale value, less energy/resources exhausted in egg production, will set on their own eggs, make excellent mothers, good longevity, and very personable pets—our ducks “Roar” when they see Rick, knowing he brings them treats! 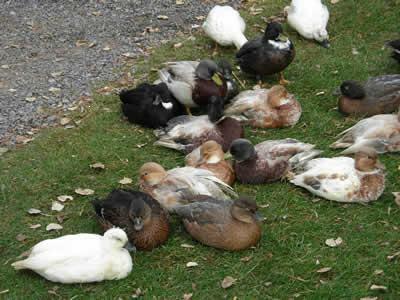 These are the bantam duck breeds and colour varieties: Call/Decoy Ducks (White, Grey, Blue Fawn, Pastel/Apricot, Butterscotch, Saxony, Buff, Khaki, Cinnamon, Snowy/Silver, Dusky, Harlequin, Spot/Pied, Magpie, Ancona, and Blue, Black, Silver, Chocolate, or Lilac/Lavender–Bibbed or Self-colours), East Indies (Black & Blue), Mallard (Grey, Snowy, White, Golden, Pastel & Blue Fawn), Australian Spotted (Silver, Green, & Blue), Silver Appleyard Miniatures, Crested Bantams, Mandarin, and Wood Duck (permit usually required in Canada). Some believe it is economical to cut corners in feeding livestock. In this hobby, we feel that it is the least of our concerns and allow our birds access to as much good food as they desire; using exercise and genetics to encourage the compact, typey potential in our bantams. Make sure in the fall that you purchase enough bird food to tide you over the winter and into spring (please note; never use medicated feed for waterfowl). Sometimes suppliers only purchase poultry food as a seasonal item; bird starter food in spring, grower in summer and finisher a bit later. If you want to keep your birds over winter, do not put yourself in a bind and rely on your supplier to have out of season bird food when you run out in November! Another good point; always feed your ducklings or goslings actual “duck and goose STARTER.” I tell you this because if you use run of the mill chicken or turkey starter (turkey starter can have more medication in it than chick starter! ), your ducks or geese could end up with a condition called “Angel Wing” or slipped wing. What happens is the wing feathers grow in backwards and it looks nasty; does not harm the bird though it inhibits flight. We feed a 16% protein, non-medicated duck & goose pellet mixed with steam rolled corn (less dusty than the unwashed cracked and we find that whole corn is too large), whole oats (great for healthy feather production especially during their molts), and wheat (we prefer not to use more than 1/3 wheat in our rations-too hot) along with fresh romaine lettuce, vegetables (chopped celery, carrot peelings, peas, etc. ), grass, and alfalfa hay. We do not use barley. Ducks will nibble all day but do like to eat at least twice a day: a.m. & p.m. The evening meal seems to be the most crucial as this allows them to fill their crop to maintain heat during the coldest part of the day, at night. Having food available “ad-lib” is great but this also seems to encourage rodents to overrun your facilities (BTW Indies are awesome mousers). We store the bulk of our bird rations in a cool, rodent proof building; our mixed bird foods in rodent proof metal garbage cans, placing smaller amounts in tall plastic dog biscuit containers in their pens. We feed the ducks their rations in shallow stainless steel puppy pans or shallow black rubber pans; emptying them each night at dark. As the weather gets colder, increase your bird’s rations (we also add extra corn to the mix) so that they may generate more heat. Watch what is left in the pans; the birds will let you know what their seasonal preferences are. Domestic ducks/geese do not need to swim all year round; they do however need access to fresh water so that they may clean their beaks while eating. We use heated insulated buckets wrapped in puckboard (riveted) or a 5-gallon cut pail (insulated by being filled from the bottom with foam insulation). We fabricate a puckboard top that limits access; otherwise your ducks will swim in the buckets. Clip the bucket handle with a brass clasp you may unthaw brass with your hands or breath much quicker than silver ones) to secure the waterers from tipping. Place a rubber mud flap under your waterers to inhibit mess (dabbling) and ensure that loosening the inevitable ice build up is possible. Change the water often, even in cold weather! Remember that you are keeping this water warm (above freezing) and therefore providing perfect conditions for bacteria/algae growth. Use a clean toilet bowl brush or plastic bristle brush to scrub out buckets/feed pans-bleach once in a while and rinse thoroughly. We switch out the heated buckets to rubber pails in summer. Encircling your pools/ponds with small gravel perimeters decreases mud dabbling. Do not forget to make sure and top up your grit containers…especially in winter. Snow and ice may cover up areas where your birds could have found their own grit. Use Grit No. 1 (chicken size) for bantam ducks, No. 2 for standard sized ducks and No. 2 or 3 for geese; a crushed marble aggregate is great. Mix liberally with crushed/flaked oyster shell (provides Calcium and Manganese & along with vitamin D3 found in sunshine, produces good egg shells) and put out in small pet bowls or mix a bit in their food. All birds require grit so their gizzards can grind food; no teethy grins from your ducklettes! If you live where it gets cold and freezes up (sometimes it feels like ALL winter), try to keep your facilities cleaned up and avoid too much layering of bedding before the really cold weather sets in. We try our best to do a major big clean out the end of October when the first snowfall is bound to happen. That way we are not in three feet of straw by April and unable to shut doors because there are too many layers piled up. Sawdust is OK for bedding but it may have sharp wood shavings, it is harder to get rid of (does not compost well, maybe burn it? ), and sawdust should never be used with baby birds; they eat it, compact crop, and die of starvation. Oat straw is the best bedding we have found! It is not sharp, not slippery, has good insulation qualities, is available from those that combine oats and has the added bonus of some seed heads which gives your birds something to forage around for. Our duck barn has dirt floors that we top with 2 to 3 inches of sand, then the straw. (There is a separate article “What is the best bedding material for poultry” which may help UK poultry keepers). Get some free wooden pallets, place bales on them and tarp with cargo tarp (regular blue tarps are useless and break down almost as quick as you put them on and not cheap either!) or proper hay tarp (these only last couple seasons too!). Use bungy cords to secure cover or planks of wood and/or concrete blocks. We became so frustrated with rodents gnawing holes in our straw/hay tarps, that we built a 20’x40′ hay/straw building; extreme but luxurious! Do not let your hay or straw get wet as it may become combustible! Never feed or put molding hay/straw in with your birds…just asking for trouble. Use wet bedding to mulch garden or compost it. I use a calf and an ATV sled in winter to move bags of feed, bales of straw/hay (get a coupla square bales of leafy alfalfa hay; gives the birds something to do over winter when not out on grass), containers of water for water changes, move crates of birds around, etc. By nestling a 50 gallon sized plastic sheep waterer inside your sled, you can easily use this setup to help transport soiled bedding when cleaning pens in winter. We compost our used bird bedding. Letting it break down for about a year or so, then use a tractor drawn rototiller and till it into our pastures, reseed, and watch how well the forage grows. When she gets down to about –25C, you may find that there are these funny little trailing piles of frozen poop and bedding following your bantam ducks around. 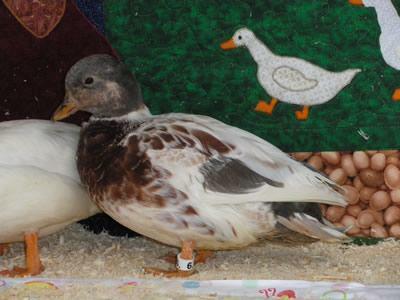 Because duck breeds like Calls and Indies (when bred to the standard) are small, during the cold they do a lot of sitting in the bedding keeping their webbed feet and legs warm. This means they do not get up too high to get rid of their manure. I try to keep a dog crate with some straw in it available just for this reason. I select the individuals with the messy bottoms and put them in the crate and take that into our heated garage. After a few hours, their cabooses fall off and out the ducks go again. I also clip duck toenails in winter as there are less abrasive materials for normal nail trimming when on straw bedding all the time. Use a pair of human nail clippers and have a small jar of flour handy to dip bleeding nails if you get too close to the quick. Ducks/geese may freeze webbed feet so give them an area out of the wind and free from snow/ice. Extreme cold will cause white areas (frostbite) around their beaks. Sometimes you cannot avoid this, as your bird dips its head in water and freezes. Careful what area you are heating as this one singular item could cause a major fire. Also ensure that if you use an extension cord, that it is rated for the heavy load that will be drawn on it. Adult ducks/geese are pretty much OK at even -40C if allowed to get out of wind/snow. Use a heat lamp in an insulated building if you need to brood for babies. We have placed a lamp over a Momma duck that was hatching babes in early spring, but do this carefully! Given the right kind of care and ancestry, bantam ducks have a life expectancy of about 15+ years. It seems over time, that reliable sources for ducks and geese are getting harder and harder to find. An obvious bonus to keeping your birds year round is that you may let a few hens sit on their egg clutches. By generating your own replacement birds whilst playing a bit with genetics, you may even come up with your own strain!